A comment from Wyre Forest BNP that touched on parking restrictions in Stourport got me thinking about where you can park correctly in Stourport. Green indicates Pay-and-Display (light for WFDC, dark for private), Red for free with restrictions (light for patrons, dark for other restriction), Yellow for on-street parking and Blue for the free car-park. 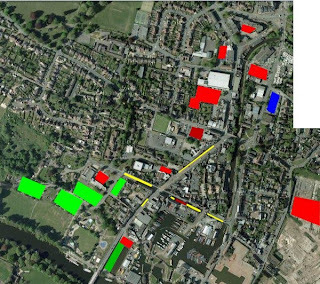 Oh and for fun I added in on the far right the proposed Tesco car-park just to show how isolated it would be. So five Green PnD car-parks which as you can see are all clustered along the riverside. Ten Red free car-parks. Eight patron only - two pubs, the council offices, four supermarkets and the library/surgery; two restricted - disabled only and the closed Swan Hotel. The Yellow on-street parking which aren't seperated into bays so you can park at any point along their length, and for the High Street inset bays only an average car-width wide. And finally the one and only Blue free car-park from which to get to town you have to cross a three-lane road and get over a canal. Hopefully from this map you can see why I'm pushing for free half-hour (ish) parking at Raven Street that's the rightmost Light Green blob. Close to the town, off the street and balances out the Blue Vale Road car-park.